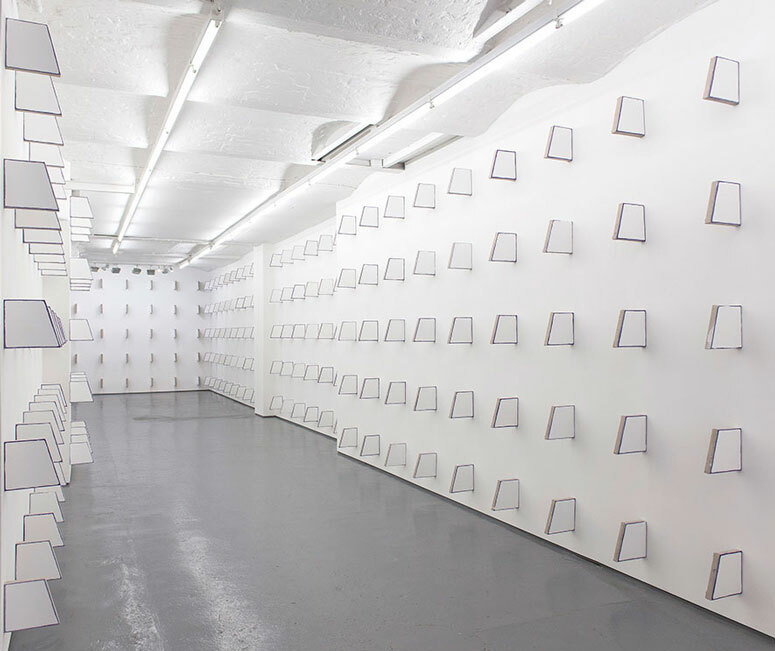 This exhilarating installation at the FOLD Gallery, by Finbar Ward, hyper-intensifies the site. It launches the viewer into a system of symmetry and transformation with its strategic sense of operation. The structure is organised to read both horizontally and vertically, but in a ritualised atmosphere, which allows the work to appear both old and new at the same moment. At first glance it feels as though the paintings are enjoying their own company. The limitation of a single element initially generates an illusion of reflection, symmetry, and a unified totality. The perception, however, is radically transformed as the viewer steps through the space, and the invisible sides of the works become visible. One of the clever oddities in this transformation of the paintings’ viewpoint is that the conditions feel different – not just because we unexpectedly see the back of the paintings, which is a temporally and spatially disorientating experience – but also psychologically, as the space operates differently according to the number of visitors in it, and their changing relationship to the work. At its maximum capacity the gallery feels utterly chaotic, and a sense of pandemonium creeps up on you. As the interaction calms down, the rhythm and emotional pitch created by the work shifts our interpretation towards an ordered sequence of operations and locational relationships. The starting point for Ward, in the history of his approach, has always been the use of an ongoing sense of failure and retrieval, as a way of allowing the work to develop an intuitive edge. This system allows the ‘mistakes’ to be the work, accidents evolving new means in a continuous feedback system. The current approach builds on the site specificity, and a mnemonic attitude that Ward fosters in the construction of each painting. A kind of visual encoding happens as the enamel skin dries in slightly different permutations. The application seems to be poured; a dense flood of industrial paint. As it touches the cobalt violet at points in its journey, it penetrates the outer oil and ground, creating an imperfect outer frame. Looking closely at the cobalt violet, I am intrigued by that specific choice, and how it draws out our attention to the edge of the support. The fluid way in which the colour is applied is reminiscent of Kenneth Noland’s Earthen Bound (1960). Ward, like Noland, is interested in the evocative power of pure colour. On a very early visit to Helen Frankenthaler’s studio Noland was impressed by her process of allowing the stain to soak into the unprimed surface. But it also seems important to identify that Noland pioneered the shaped canvas. He identified the rationalistic character, with a geometrical objective that has currency with Ward today, and which enables him to conjure up a system that transcends the physical object. But the exhibition holds more secrets. We want to unpack the hidden codes within the individual works. The colour, the letters, but also the painterly side, and here I sense that Ward’s depth of knowledge of Philip Guston is again playing a part. In particular, it might be that Ward has researched Guston’s artist’s residency at the American Academy in Rome in 1970–71. Guston’s Rome Garden paintings have a dialogue with the appearance of the supports and the use of cobalt violet. Guston’s dialogue with Italian art and culture, and his admiration of Giorgio de Chirico seems to echo the elusive metaphysical space at Fold. It also seems critical for Ward that the atmosphere has an inside/outside quality, as well as a symbolic understanding. That metaphysical notion is developed further in the work Untitled (template) (2016), which has a very particular sense of presence in the show. It seems to watch the other works, and its shadows play an important role, as they do in De Chirico’s early metaphysical paintings such as The Great Metaphysician (1917). What works here is that a mysterious chain of energy seems to be in place. It has, as with all Ward’s work, a deliberate sense of human error in its perception of ratio. We notice that Ward has chosen to stretch the linen in a slightly suffocating manner across two structures; this is the only place in the show that this happens. Binding the powder pigment coating very lightly into the surface, the weave of the linen visually vibrates against the enamel encasing at each end, which refers perhaps to Ward’s preoccupation with the feeling of entombment, seen in earlier works such as Chamber (2013), where the lid of the work is slid only half open. The structural ingenuity in Ward’s methods consistently introduce a sense of metaphor with a syntagmatic order, and this unlocks the interconnections and the works’ visual or experiential effects. The insistent feeling of claustrophobia, and an exotic geometry, are key to Ward’s approach. The tension comes from the absent, yet palpable human presence. You feel the compulsion of the maker, connecting us to both an external and an internal emotional experience, alongside a systematic dynamic that is never static, but always knowing.